The Upper East Side artist favors conscious dressing and celebrates a wardrobe of thrift-store treasures. Rappaport models a shirt made of faux lizard skin, purchased at the Angel Street Thrift Shop (118 W 17th St between Sixth and Seventh Aves; 212-229-0546, angelstreetthrift.org). She pairs it with a jacket made by an unknown Chinese designer and textured black-and-brown cotton pants from Housing Works Thrift Shop. The elaborate outfit is accessorized with an animal-skin pashmina she bought in Mumbai, India, 12 years ago. She combines it with a pre-Columbian ceramic-whorls necklace found in Peru in 1969. "The red beads, from northern India, are rudraksha seed beads," explains Rappaport. "They're also known as Shiva's Eyes. It's a prayer mala for mantras." The cotton fingerless gloves are from Paris, enhanced with two silver Mexican rings, which Rappaport's mother bought in the '60s. She found the leather knotted ring at a religious market in Bangkok in the mid-'80s. "I think it has to do with men's fertility, because the male vendor was not sure he wanted to sell it to me," she says. "He had to speak with his fellow vendors." This leather bag is accented with brass hardware and fur, and was purchased in Rome in the '60s. Rappaport's flats are printed wool, found at Housing Works. The socks are from Kmart (locations throughout the city; visit kmart.com). This Issey Miyake look was a gift from a friend. Rappaport pairs it with a Rick Owens jacket. "I love the shape," she says. "It's very sculptural, with the fitted zippers and the elongated points." She saw it the week of her birthday at Eva Gentry Consignment and loved it so much her partner bought it for her. Another Housing Works discovery, these boots are by Joan & David. Rappaport is a hat maker, and enjoys incorporating various nontraditional materials into her work. She dons a style that's part of a series constructed from industrial felt. "I love the scale and the sculptural quality of my hats," she says. The milliner also sports an earring that's actually an oversize paper clip Rappaport found in a stationery store in San Diego. "Hair is a textile, which I love to manipulate as sculpture," says Rappaport, who loves short hair because it can be shaped in a variety of ways and adjusted with a bit of water. Her stylist, Shannon Arell, suggested dying it pink a few years ago. Rappaport handmade these cuffs from paper, cloth and tape; she also sells them (e-mail debrathenutritionista@gmail.com for more info). Rappaport isn't quite sure which brand made this frock (it's label-less and was a gift). She found the dyed feather coat at Angel Street Thrift Shop. The hat is another industrial-felt creation of Rappaport's own design. The sunglasses are collapsible vintage Pierre Cardins from the '80s, purchased at a NYC store. "I love the blue glass," says Rappaport. The taffeta scarf was given to Rappaport by a friend. Vintage yellow rayon gloves, another gift, complete the look. "These are the most comfortable shoes I own," enthuses Rappaport of her brown-and-yellow T-strap heels, which are from Remix Vintage Shoes (remixvintageshoes.com) in L.A.
Rappaport bought this pre-Columbian silver bracelet in Peru 43 years ago. "It is very light and works with many outfits," she says. This boiled-wool bag features a plastic tortoiseshell handle; Rappaport added a shoulder strap and gathered it with stitching to get it back into shape. She found it at Housing Works. Rappaport acquired her white wool dress at AllSaints Spitalfields (512 Broadway between Broome and Spring Sts; 646-862-1832, us.allsaints.com). "I love the shape, and how it moves gracefully," she enthuses. She pairs it with a mauve Mongolian lamb boa from St. Luke's Thrift Shop (487 Hudson St at Grove St; 212-924-9364, stlukeinthefields.org). The vintage black suede gloves are another gift from a friend, originally belonging to her 97-year-old mother. Rappaport created the wrist cuffs out of found materials such as ribbon, cloth, paper, vinyl tape and children's party favors. Rappaport's brass elephant earrings are 1940s-era Joseph; she's owned them for about 20 years. She bought them from a vintage dealer at the GreenFlea (Columbus Ave between 76th and 77th Sts; 212-239-3025, greenfleamarkets.com; Sun 10am--5:30pm). Red suede vintage shoes from the '70s, a gift from a friend, are accented with a pair of Kmart socks. "I wore them in a recent Kmart ad and loved them, so I had to go buy several pairs," says Rappaport. "I also sent them on to sock-lover friends." This '80s red-and-green leather bag was made in Paris. "It's a great piece of sculpture," Rappaport notes. Her personal style: "I use my body as an armature and apply color, texture and layering to create the desired sculptural effect." Her inspirations: "Style is healing. Vitality and good health informs who I am and everything in my environment, including found materials, color, textures, nature, food and form." Favorite stores: "Eva Gentry Consignment (371 Atlantic Ave between Bond and Hoyt Sts, Boerum Hill, Brooklyn; 718-522-3522, evagentry.com) features a neutral palette with very sculptural, architectural clothes and a beautiful choice of fabrics. You never know what you'll find at Housing Works Thrift Shops (locations throughout the city; visit shop.housingworks.org), and it's always challenging. Comme des Garons (520 W 22nd St between Tenth and Eleventh Aves; 212-604-9200, comme-des-garcons.com) because it's innovative, unusual and unexpected, with a great use of mixed materials and forms." Her signature accessory: "[I adore] hats and all things that frame the face, like boas, epaulets, collars and leis." 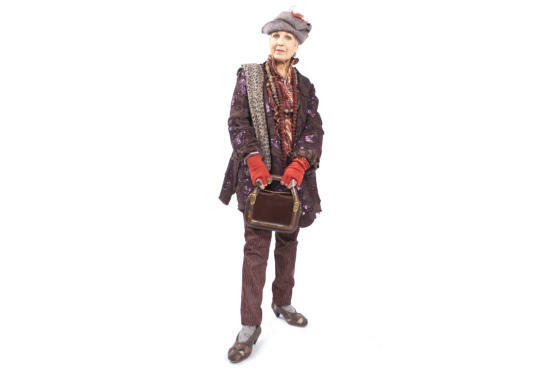 Her New York fashion icon: "I love Tziporah Salamon. She has a great collection of outstanding textiles and clothing, and applies them to her body as magnificent sculptural paintings. My celebrity favorite is Tilda Swinton—she is stunning and always makes a statement." Favorite salon: "My [stylist] is Shannon Arell; she does house calls [and offers me] personal attention. She also works at the Marie Bove Salon (27 E 20th St between Broadway and Park Ave; 212-533-3400, mariebove.com)." How her style has evolved: "My approach has been the same since I was very young: sculptural, layered and painterly. As I age, and since I've been practicing yoga for more than nine years, I especially feel comfortable and fabulous wearing fitted clothes. I try to dress age-appropriate, from my point of view, while having fun and taking pleasure in the process." How her career influences her style: "All parts of me are integrated at this point in my life. Even when I do cooking demos or body work, I will dress for comfort, but it's always fun, layered, colorful and accessorized. Whatever is on my body has an influence on how I feel, and therefore how I act at work."